This server has received 2229194 hits from both ipv4 and ipv6. With the release of Joomla 1.6 just announced the question on everyone’s lips was: “Should I upgrade?”. After some discussion the group decided that at this point, an upgrade should not be done to an existing site. 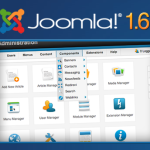 Only if a new site was being built should Joomla 1.6 be used. Joomla 1.5 will be fully supported for at least 1 year, so there is time for the new release to settle in, and perhaps easy upgrade tools will be developed. Some of the developers at the meeting also said they’d not be using Joomla 1.6 just yet as it was likely to contain some bugs and they’d wait for Joomla 1.6.4 (or thereabouts) to be released. The discussion on Joomla 1.6 moved on to Molajo, which is a package of Joomla components plus some coding changes over the standard Joomla. Molajo was set up fairly recently by some of the people who have had a lot of involvment in Joomla. It remains to be seen whether it will develop into a true fork of Joomla, or if the features tried out and testing in Molajo will make their way back to the core. Check out Nooku framework too. The main presentation described how to get started with creating a new Joomla template. Melvyn Phillips showed how to use an off-the-shelf CSS framework to quickly put together a grid based site. Given the complexity of Joomla, creating a new template may seem offputting to many. Melvyn showed us how to create a basic 3 column template from scratch in just 5 minutes. 2020Media was recently asked to take over hosting of a legacy Joomla 1.0 website and we completed the migration successfully this week. The customers website had been broken because their host upgraded their server to a new version of PHP without telling them. At 2020Media we never do this. For any enquiries about Joomla 1.5, 1.6 or even 1.0, please contact us.